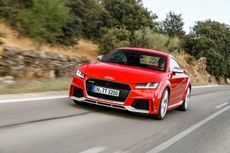 We drive the fastest Audi TT yet: a 395bhp coupe that covers the 0-62mph sprint faster than most supercars. But is it fun to drive? With its striking, SUV-inspired styling and gangsta-sized 20-inch alloys, the all-new Scenic is cooler than a warehouse full of Magnums. Does it also have the practicality, versatility and comfort to meet modern family demands, though? The Kia Optima Sportswagon is a family estate car that competes with popular rival wagons like the Ford Mondeo, Vauxhall Insignia and Volkswagen Passat. It’s not the strongest in the class for driving manners, but it’s spacious, stylish and sensational value for money. Kia’s family saloon gets a new plug-in hybrid version with super-impressive efficiency figures, but a sensible pricetag. Question is, is it any good? We drive the Scirocco GTS, one of the sportiest versions of VW's likeable coupe - does it still have what it take to take on modern coupes and hot hatches? We test it to find out. Like previous Meganes, the latest version of Renault's family hatchback aims to appeal to buyers with its style and technology. So, is it a winning formula? The Renault Clio has always been a solid choice for anyone looking at a supermini, but it now has revised looks, an upgraded interior and a new engine/gearbox combination. We’ve already been very impressed with Volvo’s new V90 estate car having driven it in Spain, but how does its saloon sister fare when faced with a bigger challenge – British roads? The Ioniq is the first car to be launched with three different electrified powertrains, but is that enough to give it the edge over the Toyota Prius, Nissan Leaf and more conventional diesel hatchbacks? 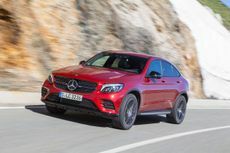 We drive the sportier version of the Mercedes GLC – which keeps its four doors, but gains a slinkier body, new engines, and lowered suspension for improved handling.